The book devotes two pages to each of the 148 tests Richie played. To complement the stunning array of images, Richie has added his own thoughts and memories of each game — from the nerves before that very first test in 2001 to the triumphs at Rugby World Cups in 2011 and 2015; from the highs of three World Player of the Year awards to concussions and other injuries that kept him from playing; from the great homes of rugby such as Twickenham and Ellis Park to the atmosphere of the All Blacks’ only visit to Apia Park Stadium or Soldier Field in Chicago. 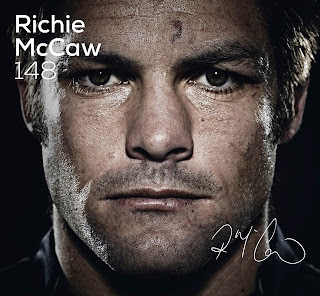 McCaw has been part of rugby like no other player and led a team that dominated world rugby in his era. This book illustrates the pride McCaw and the All Blacks feel in the black jersey, the lengths they are prepared to lay their bodies on the line for their country, and the satisfaction of a job well done. It is a fitting tribute to a man regarded by many as the greatest player of all time.